Gunnthra finds herself mostly in need of attack. The natural speed advantage gained from Chilling Seal means that she prefers attack to speed, unlike most offensive units. Aside from her resistance, she really doesn't need her other stats for much, unless you wish to run Ploy skills on her. +ATK Attack is more important for Cavalry teams and makes it easier for Gunnthra to trigger Heavy Blade, and lets her OHKO Fury Ike, Distant Counter Ayra as well as Winter Tharja. This is the same case on her Blade tome build, where it gives her the required power to OHKO Hector and Effie. SPD She will have plenty of speed after a Hone Cavalry and her Chilling Seal debuffs. HP Not as important as resistance. Can be reduced safely if necessary. RES mostly affects her Ploy skill prospects. More important on Blizzard builds than Blade ones. -DEF Defense is her least important stat and is the best stat for a bane, as she will not be used to tank physical damage. Gunnthra is strongest within a Cavalry team. She can support allies such as Brave Lyn, Reinhardt, Ursula, Olwen, Siegbert and Brave Roy. Fury gives her a very well-rounded stat increase, bring her to 31 resistance and offensively to 34/36. Hone Cavalry lets her buff her allies, and works exceptionally well with allied Blade tome users. If you want to use her on a non-cavalry team, simply switch out Hone Cavalry for Res Ploy. Chilling Seal is a natural choice thanks to its great synergy with Blizzard. Due to Blizzard's effect, she should limit herself to attacking only targets with the Chilling Seal debuff on them, as she is far weaker with them factored in. However she can tank and KO some magic threats such as Linde, Delthea and Lute with no debuffs. Glimmer is best if you plan on giving Gunnthra buffs during combat. Since she does not run a Blade tome, she is one of a few select offensive mages who can trigger specials in a single round of combat. Therefore, Heavy Blade is a great choice on her, since she wishes to increase her special charge. It's also very easy to activate Heavy Blade thanks to the debuffs provided by Chilling Seal. Quickened Pulse is a decent alternative, but it will only work in one battle. She can run a very similar Blade Tome set to excellent effect. This set is more reliable than her Blizzard one, has even stronger synergy with Cavalry teams and more raw power. This version of Gunnthra is no longer reliant on Chilling Seal's debuffs giving her more choice about her targets, and she has significantly better matchups compared to the Blizzard build without factoring in Chilling Seal. However it lacks resistance compared to the above set, and loses a lot of effectiveness outside Cavalry teams, thanks to their much stronger buffs being required to power the Blade tome. Glimmer is the special of choice, thanks to its scaling which works well with Blade tomes and their massive attack. And despite not carrying Blizzard, she still prefers Chilling Seal for it's speed debuff. Fury gives her an offensive boost without sacrificing her resistance, which is especially important if you wish for Gunnthra to use Ploy Skills. Gunnthra's seal slot is generally best taken by Attack+3. If you don't have an attack boon, this is required to get the OHKO on Effie and Hector. If you have an attack boon or don't care about those matchups, she can run a Ploy skill or Hone to support allies. Gunnthra is the second Legendary Hero to be added to the game, taking on the mantle of the wind element. She is one of only two green cavalry mages, the other being Cecilia who has a comparable statline minus the unique skill options. She can be used on offense or defense, but is stronger on the attack, especially with a Blade tome. Low defense makes her susceptible to units with Distant Counter, but this is alleviated someone thanks to her unique skill, Chilling Seal. Gunnthra has good offensive stats and her status as a Legendary Hero makes it likely she will be an important unit into the future. Her decent offensive statline combined with increased movement means that Gunnthra is a threatening force on the field. Her Chilling Seal skill also synergises well with her legendary tome, which grows stronger with debuffs. And if you care, her status as a Legendary hero gives her some story relevancy. But she suffers from the weaknesses of most mages. Low physical defense makes it tough for her to survive combat against physical damage. And with many red and green units possessing Distant Counter, she must be careful about which targets she chooses. Decent offensive statline combined with increased movement. She has the highest combined attack and speed for a Cavalry mage, handily beating out Cecilia’s low 25 speed. Being a Cavalry unit gives her excellent offensive reach, and she is able to cover large amounts of ground with her ranged attack and increased movement. Strong unique skills that synergise well. 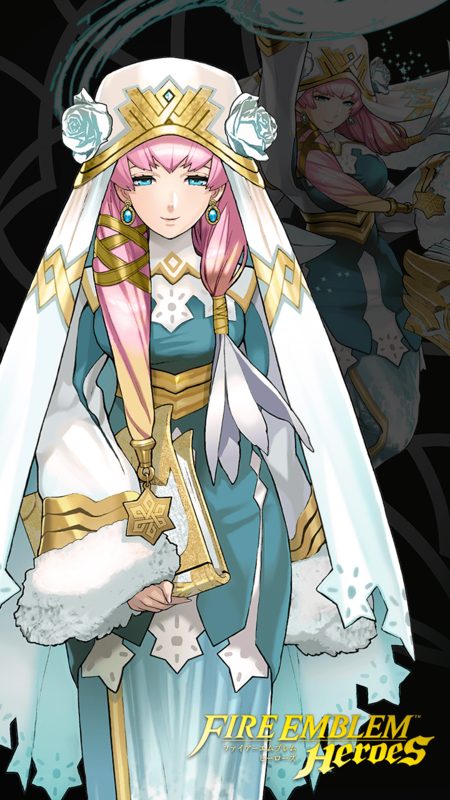 Gunnthra has a unique weapon, Blizzard and the Chilling Seal skill which cannot be inherited. Blizzard can be thought of as a Blade tome in reverse: It gains bonus damage based on a foe’s stat penalties at the time of attacking. Debuffs from Chiling Seal, Threaten, Seal and Ploy skills will all increase her damage. However, debuffs from Panic Ploy will not boost her damage. Chilling Seal has excellent synergy with Blizzard, providing Gunnthra with a guaranteed target in every game. It is especially effective vs. glass cannons who choose skills such as Life and Death to maximize their damage. Being a Legendary Hero means that Gunnthra can grant allies certain stat buffs just for being on her team. An ally with a Wind Blessing will get +3 HP and +4 resistance while fighting alongside her during the wind season. She is susceptible to physical damage such as that from Brave Bows. She is also ironically weak to opposing Gunnthra’s, who more often than not target her for their Chilling Seal debuff. Gunnthra’s resistance is decent, but base 25 (or 28 with Blizzard) is nothing to write home about. Many red and green units possess Distant Counter. Blade tome users of all colors can hit the type they are weak against for heavy damage, but many red units are equipped with natural Distant Counter to ruin her day. Many of them have high defense stats, meaning that they are unlikely to be debuffed. Chilling Seal can be inconvenient, as it debuffs low defense units rather than low-resistance ones she would rather focus on attacking. If she can debuff their attack, she can sometimes survive a hit from some red units with Distant Counter. Gunnthra is a stellar support unit, being capable of assisting team-mates in destroying foes, or doing so herself. Her unavoidable debuff is guaranteed to be useful in every match. She is right at home in Cavalry teams, where Hone Cavalry can bolster her average offenses to compete with the strongest mages. Blade tome variants will want to stick to Cavalry teams, but Gunnthra operates effectively in mixed squadrons. Ayra, Mia, Tiki, Ryoma and Ike - All appreciate her ability to handle blue mages, their critical weakness. Brave Lyn, Reinhardt, Eldigan, Sigurd, L'Arachel, Olwen - Typical cavalry partners for her, who she can exchange buffs with. Red units with Distant Counter pose a massive threat to her existence, and their high defense makes them unlikely targets for Chilling Seal. Strong Blade tome users can one shot her with ease, but fear her debuffs. Keep in mind that as a general rule, Gunnthra can overwhelm most of her usual counters if they are affected with her Chilling Seal debuff. Ike, Ryoma, Black Knight, Ayra, Mia, Zephiel and Sigurd all threaten to KO her when equipped with Distant Counter. Winter Tharja, Katarina, Sanaki, Tharja, Sophia and Lilina - Strong Blade tomers who can one shot her, but some fear Chilling Seal. Gunnthra is a really cool hero, and I got her at +spd -def. While the page says otherwise, +Spd is actually a really good boon. With all the speed buffs she will be able to double even the fastest units in the game. While bond still can work well, the solo is the best one especially because she is Calvary and can outrun her teammates. Her attack will reach sky high with debuffs (make sure to have someone with chill res on your team too), so heavy blade is the best option here. With heavy blade, glimmer is also great. Since M oonbow isn't that great when you are debuffing your opponent and with gunnthra's attack being really high with all the debuffs, glimmer will ensure her special proc for a lot of damage. The wave skills are also great because she is self reliant. I opted for attack wave, but speed wave works just as well too. I like how the res boon balances her hp bane (so that she&#039;s still in the 145-150 bst bin). Also helps her ploy other units. Base kit is great, although I don&#039;t like fortress res 3 on her as her base attack isn&#039;t high to begin with. So fury 3 comes into place, bumping up all her stats by 3 (with the exception of hp). Mine is +atk. So I took advantage of her good atk and put death blow. her res isn't so good but I still kept her c skill since I was too lazy to find a new skill to put on her. With having death blow and her B exclusive skill it, allows her to do more damage and have a bigger advantage. This build ultilize the power of her weapon to their maximum potential by applying as much debuffs as possible to one enemy, resulting a whooping +22 damage bonus from Blizzard if she pulls off Chilling Seal with Res/Def Ploy 3. Resistance boon is pretty much a must as she has to have high Res in order to activate ploys, even on a high Resistance unit. The next time you don’t pull a +Atk Gunnthrá, this is a much better alternative if you want minimal investment but still want to use her on your team. Good luck summoners! Summoning on Legendary banners is the worst and I'd never wish it upon anyone; this build is just for the people who happen to have a +Res -Def/-HP Gunnthra (although +Atk and +Spd and no -Res bane also work for this, they just get ploys off less). Between Blizzard, a superboon, and the Res +3 seal, even with the Life and Death penalty, Gunnthra still has plenty of Res to get off ploys, which then boosts her offensive potential with Blizzard. Swift Sparrow can be taken over Life and Death, but it makes Gunnthra less offensively potent and more defensive. Both of these options, however, are infinitely more preferable than Fury, which actively works against Gunnthra's prf chill skill. Don't put Fury on Gunnthra if you have Chilling Seal as her B. If running Life and Death, Draconic Aura is marginally better than Iceberg. If running Swift Sparrow, then Iceberg should be taken instead. BlizzardGrants Res+3. Grants bonus to unit's Atk equal to total penalties on foe during combat. Chilling WindBoosts damage dealt by 50% of unit's Res. GlaciesBoosts damage dealt by 80% of unit's Res. Fortress Res 1Grants Res+3. Inflicts Atk-3. Fortress Res 2Grants Res+4. Inflicts Atk-3. Fortress Res 3Grants Res+5. Inflicts Atk-3. Chilling SealAt the start of each turn, if unit's HP ≥ 50%, inflicts Atk/Spd-6 on foe on the enemy team with the lowest Def through its next action. (Skill cannot be inherited.) If there is a tie between several units, they will all get the debuff.